Vincent Gospodinovich (1882-1964) was born December 14, 1882 on Vis, Split-Dalmatia County, Croatia. 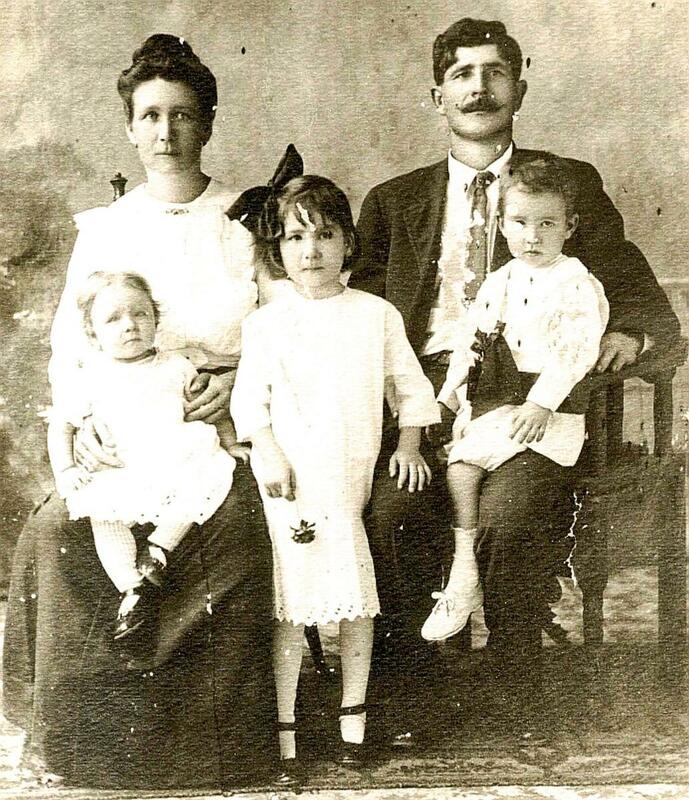 He married Jacobina Trebotich (1883-1980), a native of Brac, Split-Dalmatia County, Croatia in Harrison County, Mississippi on May 28, 1906. She was the daughter of Mateo Trebotich (1853-1935) and Katie Sekul (1859-1948). 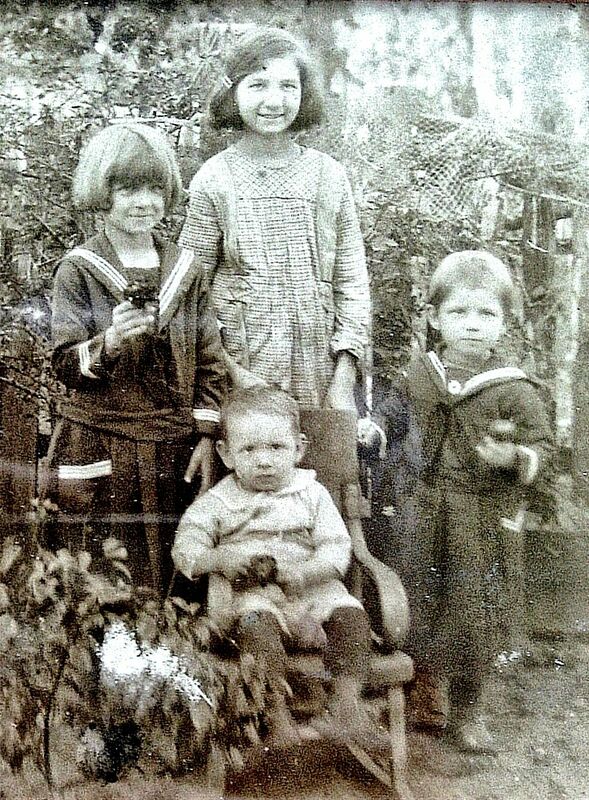 Catherine 'Katie' Gospodinovich (1910-1986) m. Charles M. Davis (1914-2000); Matre Gospodinovich (1912-2003) m. Doris Borries (1913-1951) and Rose Mary Fayard; Jacobena Gospodinovich (1914-2006) m. John H. Tabb (1914-1972); Dumena Gospodinovich (1919-2001) m. John A. DeSilvey (1918-1996); Domenic Gospodinovich (1921-1996) m. Marie Landry Milian (1922-2012); and Margaret Gospodinich (1923-2008) m. Dominic T. Leperi (1920-2004). 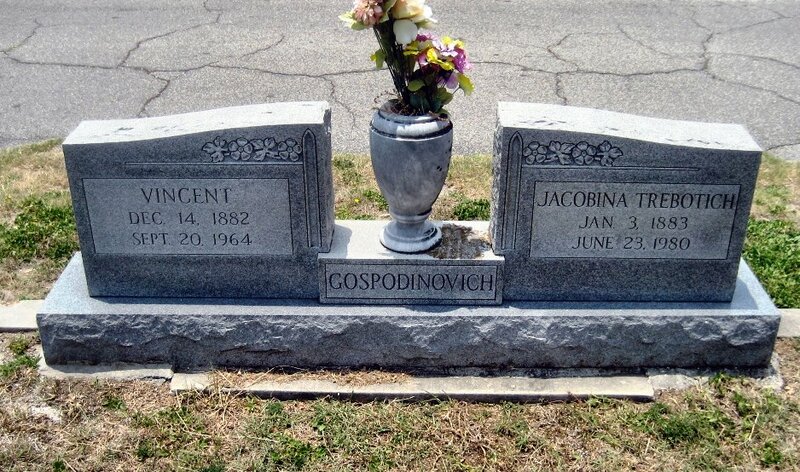 Jacobina Gospodinovich Tabb (1914-2006), age 91 years, of Biloxi, Mississippi died in Ocean Springs on January 3, 2006. 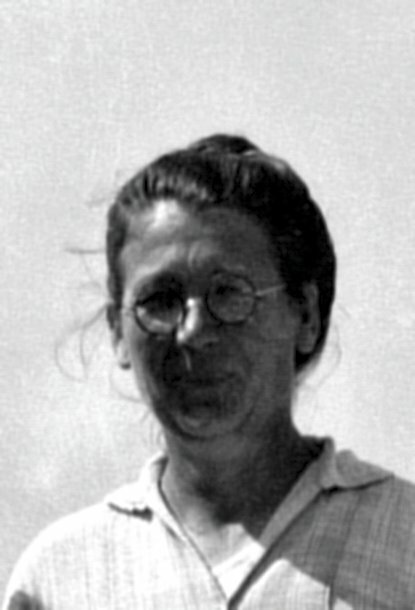 Mrs. Tabb was born in Biloxi, Mississippi on March 21, 1914 to Vincent Gospodinovich and Jacobina Trebotich Gospodinovich. She was a lifelong resident of Biloxi having lived in the home she was born in on the Point until Katrina swept it away. She worked in the seafood industry until she was 80 years old. Mrs. Tabb was known as Aunt Jack to her many nieces and nephews and Granny to the vendors at the farmers market. She loved gardening and was a member of St. Michael's Catholic Church. Mrs. Tabb was preceded in death by her husband of 33 years, John Henry Tabb; her brothers, Anthony, Matre, and Dominic; her sisters, Frances Gospodinovich, Katie Davis, Hendrieta Gospodinovich and Domena DeSilvey. 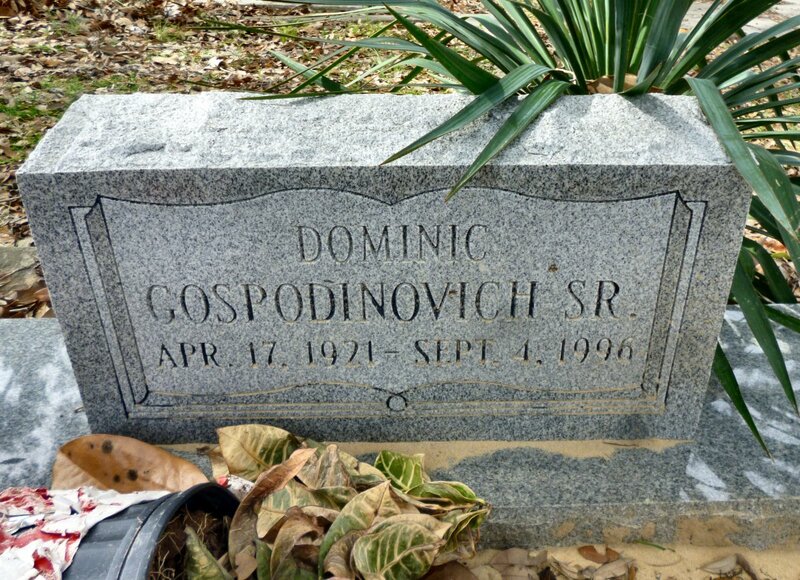 Domenic Gospodinovich (1921-1996) was born at Biloxi, Mississippi on April 17, 1921. He passed on September 4, 1996. Dominic married Marie Landry Taranto Adams Milian (1922-2012). [Ray] It looks like the "h" was added to the Yugoslavian names when they got here. I took pictures of the cemetery in Brac when I was there in 1985 and the "vic" was without an "h". Also, if you look in the cemetery in Biloxi some graves say "Austro Hungary", some "Dalmatia", some "Yugoslavia", but they were all born in the same town. It's just whoever ruled the country at a particular time. 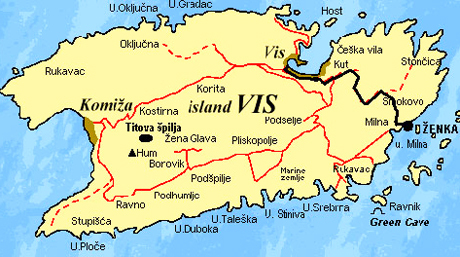 Grandpa was from the island of Vis. 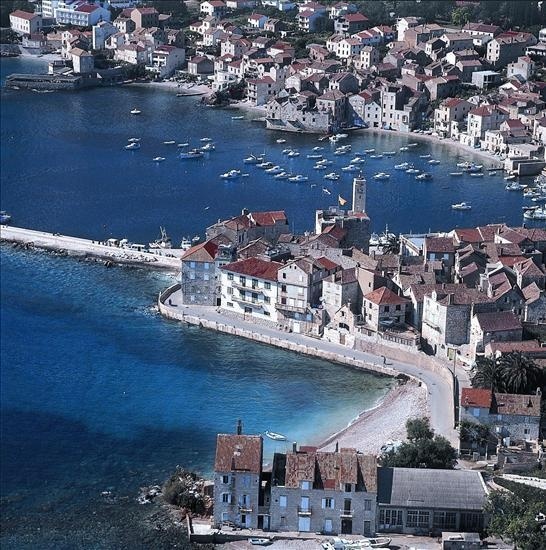 Grandma was from Bobovise, Island of Brac. 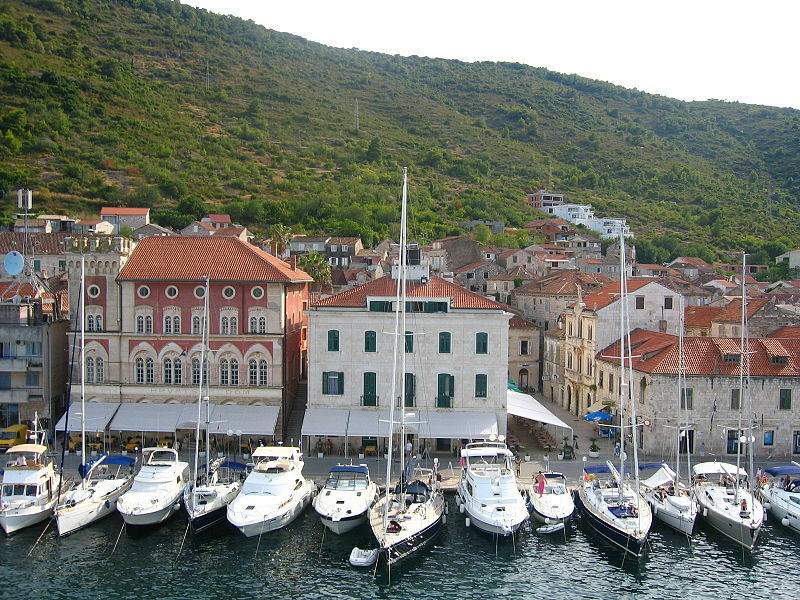 I went to Bobovise in 1985 but could not visit Vis as it was a military installation. Grandpa worked on the boats with my great grandpa Trebotich (great grandma Sekul) and rented a room from them on Cedar St. He sent for his brothers and mama. She didn't like Biloxi so they went to Washington State. I have a picture of grandpa's daddy in the Austrian? Navy taken in the 1890s?, but I think he died before grandpa came here. This is about my grandpa's sister. The text is from The Daily Herald of April 29, 1921. I left the spellings as they were. The spelling on the tombstone is Andrijila Gospodinovich born May 24, 1897 and died April 25, 1921. Mama said she died of a broken heart because her brother in Washington caught pneumonia and died. She was in New Orleans to see Brother Isaih [sic] who was supposed to be a healer. Mama said the casket was on a horse drawn carriage. “The funeral of Miss Audrejea Guspodinovich, who died in New Orleans and was buried yesterday afternoon, was one of the most unusual held in Biloxi in some years. The body of the deceased woman was brought to Biloxi where it lay in state for the usual time. The funeral services began yesterday afternoon at 4 o'clock when the body was taken to the St. Michael church where special services were conducted with Rev. Father Nelius Downing officiating. Following the impressive services, the funeral cortege proceeded to the cemetery headed by a brass band which played a number of funeral marches. There were in attendance at the funeral a large number of people, mostly residents of the eastern section of the city. A number of young women also acted as honorary pallbearers, carrying large wreaths and beautiful flowers which were placed upon the grave. Other services were held at the cemetery, the funeral consuming several hours to carry out." The Biloxi Daily Herald,“City News”, May 29, 1906. The Daily Herald,“Change of masters at Customs House”, September 20, 1919. The Daily Herald, “Mrs. Gospodinovich dies”, March 17, 1937. 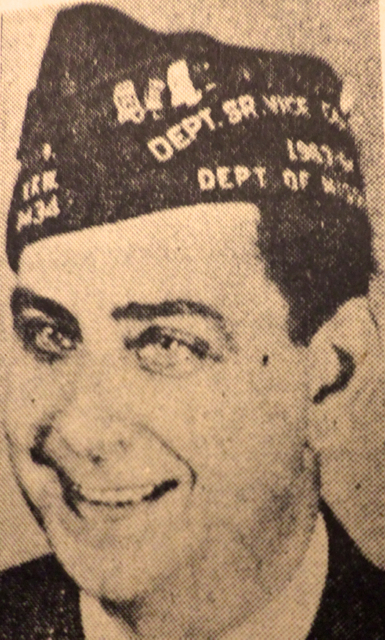 The Daily Herald,“[Doris Borries] Gospodinovich death”, February 27, 1951. The Daily Herald,“Two injured as speeding auto hits another”, December 18, 1950. The Daily Herald,“Mrs. 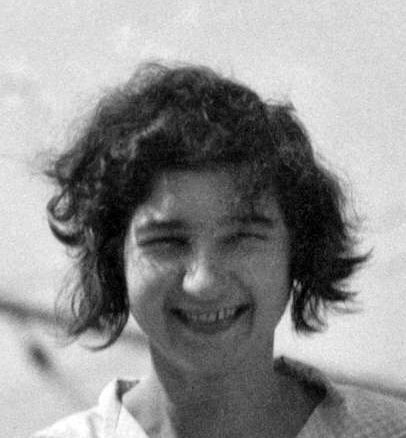 Jacobina T. Gospodinovich”, June 24, 1980. The Orlando Sentinel [Florida], "John A. DeSilvey", July 2, 1996. The Sun Herald,“Dominic Gospodinovich Sr.”, September 5, 1996. The Sun Herald,“Charles M. Davis”, October 3, 2000. The Sun Herald,“Domena DeSilvey”, June 21, 2001. The Sun Herald,“Matre Gospodinovich”, March 14, 2003. The Sun Herald,“Dominic T. Leperi Sr.”, August 25, 2004. The Sun Herald,“Jacobina Gospodinovich Tabb”, January 6, 2006. The Sun Herald,“Margaret Gospodinovich Leperi”, November 12, 2008. Marco Moulyet (1853-1935) was born on the island of Vis, Split-Dalmatia County. In October 1875 he landed at Pensacola, Florida having left an English port on the North Sea. Marco settled on Mobile Bay at Tatumville situated between Fairhope and Point Clear in lower Mobile County, Alabama where he married Elmira M. Odum, a widow. 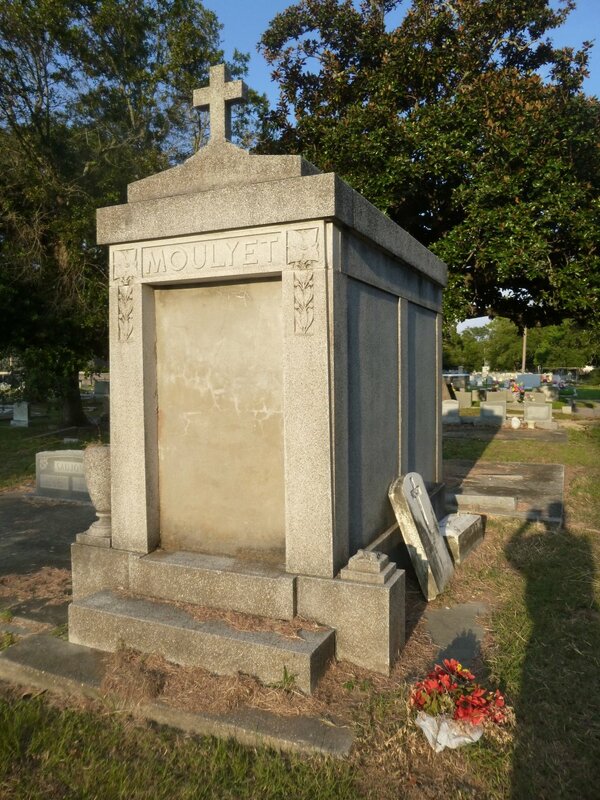 Here in the Point Clear, Alabama area, his known children were born: Lucy Moulyet (1879-1961) m. S.R. Tipton; Annie Moulyet (1881-1968) m. Mr. Ethridge; Joshua Mark Moulyet (1882-1977) m. Martha Howell (1881-1975); Nicholas Moulyet (1884-1975) m. Theodosia Bransen; Joseph Grade Moulyet (1886-1954) m. Halcie Bailey (1891-1971); Mary Moulyet (1888-1973) m. Mr. Brinkman; and Elmira Moulyet (b. 1890). 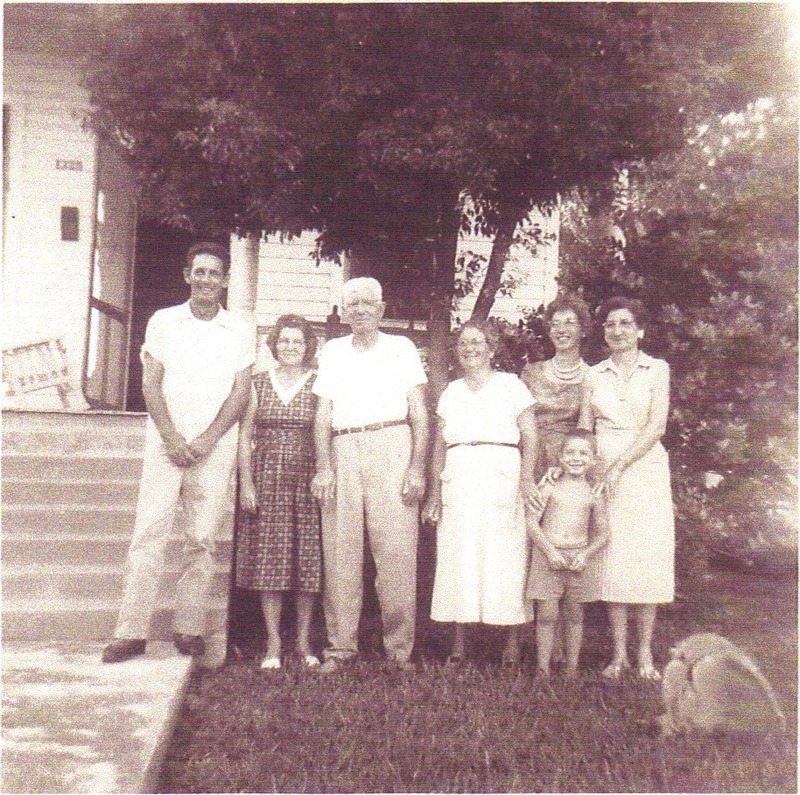 Marco relocated to Biloxi, Mississippi circa 1896 and found work in the seafood industry. He married Edwina ? circa 1892. By 1921, he was a factory foreman and domiciled at 1415 1st Street. Southern District Court-Biloxi, Mississippi, Petition for Naturalization No. 273-June 7, 1921. The Daily Herald, 'Austrians apply for citizenship', June 10, 1921. The Daily Herald, 'Marco Moelyet [sic] dies", April 5, 1935, p. 6.